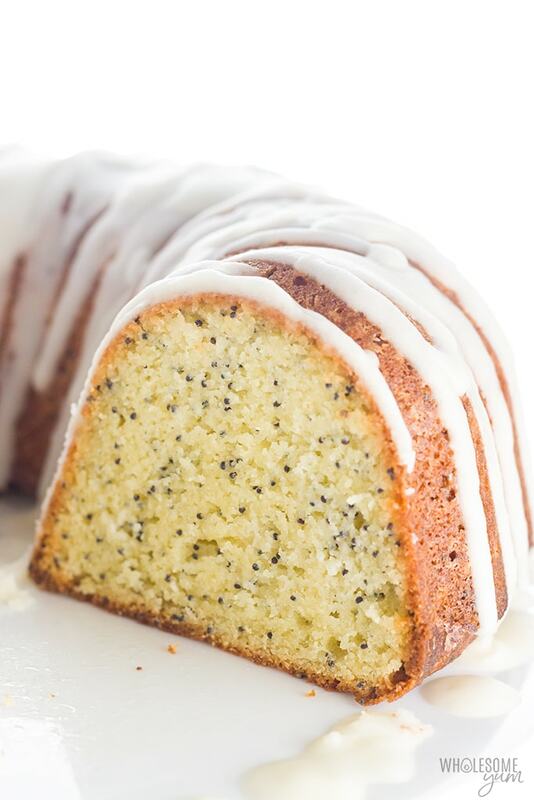 This easy lemon poppy seed bundt cake with almond flour has no sugar or grains. It's the best low carb keto pound cake recipe I've ever had - and prep takes just 15 minutes! My oldest daughter’s birthday was yesterday. I can’t believe she is three already! We haven’t had the celebration yet, and I’ve been thinking about what dessert to serve at her party. This keto gluten-free pound cake recipe was a big hit the last time I made it, so it has a strong place in the running. Even though sugar-free pound cake is not exactly a traditional birthday cake, I like experimenting with different types of dessert. My daughter is too young to know the difference, anyway. That being said, the yellow birthday cake I made for her last year went over really well. I might just make that again. It’s so hard to decide! Making low carb dessert recipes for special occasions is always so much fun for me. 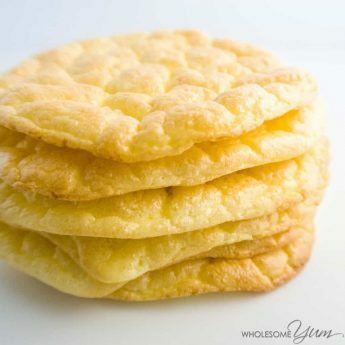 Even though everyone knows I am low carb and gluten-free, I still get questions like, “are you sure this has no sugar or flour?” And, I love hearing them. It’s encouraging to show others that this lifestyle doesn’t have to be boring or restrictive. 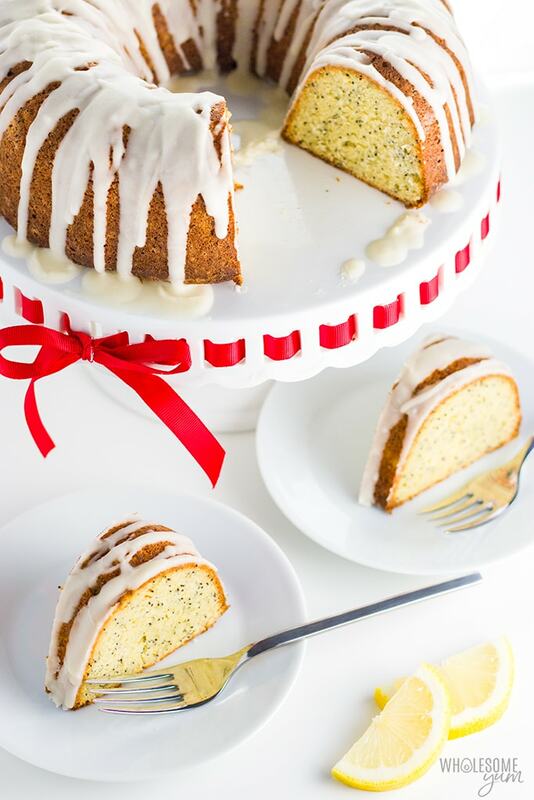 This lemon poppy seed bundt cake prompts those questions every time I make it! It also happens to be perfect for upcoming spring holidays. If it doesn’t make an appearance at the birthday party, I know I’ll make it again soon. 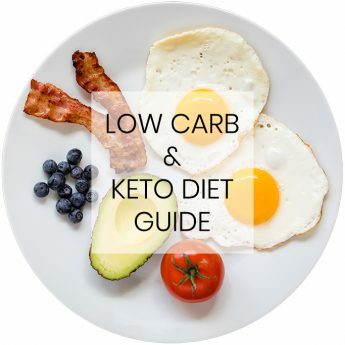 What is the difference between a keto pound cake and a bundt cake? Technically, any cake made in a bundt pan is a bundt cake. But in most cases, the type of cake most often made in a bundt pan are pound cakes. Moisture is especially important in a gluten-free bundt cake, because there is more surface area than a traditional loaf pan or cake pan. So, a moist batter ensures that it isn’t dry. The good news? Making pound cake in a bundt pan means you get more delicious crusty edges! Baking time varies depending on your pan. Shallower pans require less time in the oven, deeper ones mean longer baking time. I used a bundt pan, but will offer options below if you want to use some other type. The particular low carb pound cake recipe I’m sharing is made in this 12-cup bundt pan. They call it a fluted tube pan. A bundt pan is a certain type of tube pan. There are others that have flat, vertical sides, and typically larger capacity. 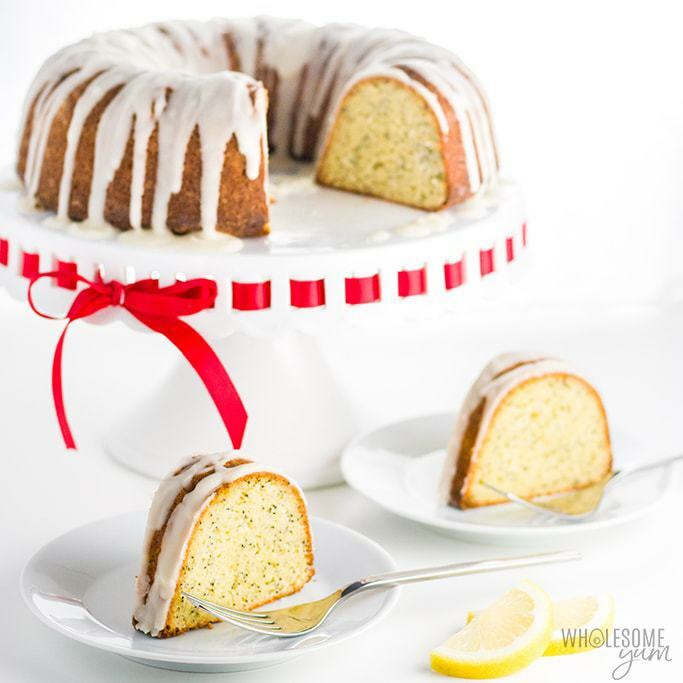 If you don’t have a bundt pan, you can use two small rectangular loaf pans, two round cake pans, or a single 9×13 pan. The smaller pans will require reducing baking time, and the large 9×13 pan will require more time. 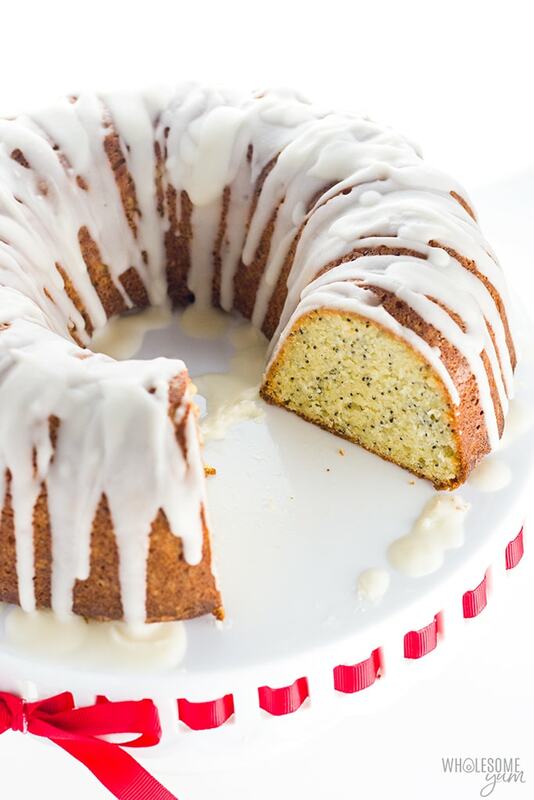 Lemon poppy seed bundt cake is one of my favorite kinds of gluten-free pound cake! Doesn’t it just remind you of your favorite coffeehouse? The flavor is unbeatable. After some deliberation, I decided to make this keto pound cake with almond flour. 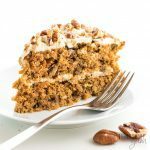 It was a similar dilemma to the one I had when making low carb carrot cake recently. Ultimately, almond flour produces the ideal texture for a gluten-free pound cake. Make sure to use blanched finely ground almond flour for best results. That being said, I’m pretty sure that coconut flour would make a decent pound cake, too. After all, that type of cake is supposed to be dense. Coconut flour is known to be dense in baked goods. So, let me know if you want to see a low carb pound cake recipe with coconut flour in the future! 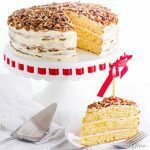 If you want a bundt cake recipe that uses both types of flours together, try Kentucky butter cake. 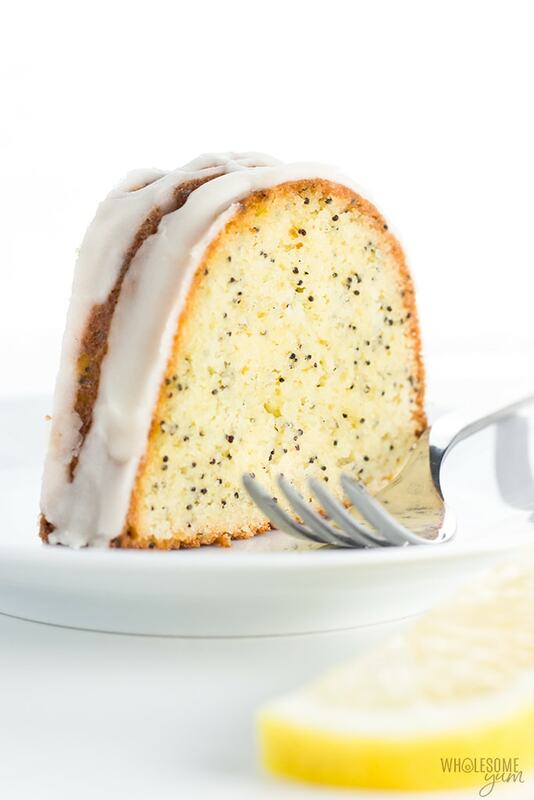 This lemon poppy seed bundt cake pairs perfectly with a lemon glaze. And, the bundt shape provides lots of surface area for it. That’s one of the advantages of a bundt pan instead of other shapes. The lemon glaze is very easy to make. All you need is powdered sweetener, lemon juice, and vanilla extract. Whisk them together, and viola! The perfect glaze for your keto pound cake. You can adjust the consistency of the glaze as needed by just adding more lemon juice if it’s too thick, or more sweetener if it’s too thin. It’s pretty versatile. Keep in mind that you want it to be fairly liquid to drizzle easily. It does set and harden after some time. This low carb pound cake with almond flour is perfect for special occasions. It’s large enough to feed a crowd, and looks impressive without a lot of work. But, what do you do if you have leftovers? Don’t worry, gluten-free bundt cake stores very well. You can keep it in the refrigerator for up to a week. If that’s not long enough, freeze it for even longer. Then, you can thaw it in the fridge. Reheating works okay, but the glaze will soak into the cake a little. When I first tested this keto pound cake recipe, I didn’t have a specific occasion for it. So, I sliced it and stuck it in the freezer. 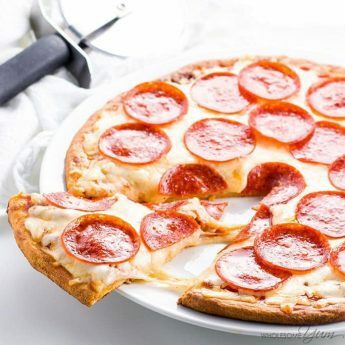 Now, I take out a couple slices at a time, put them in the fridge, and have a yummy breakfast to enjoy with my keto coffee in the morning. 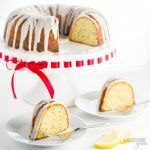 Bundt pan – Of course you need a bundt pan to make low carb bundt cake, right?! Cooling rack – Increases air flow for cooling. This one is oven-safef, so you can also use it for making bacon wrapped asparagus! Preheat the oven to 350 degrees F (177 degrees C). Grease a bundt pan and set aside. To make the glaze, whisk together the powdered sweetener, lemon juice and vanilla extract. Drizzle over the cake. Click or tap on the image below to play the video. It's the easiest way to learn how to make Low Carb Pound Cake! Wonderful! Replaced 1 cup of the almond flour with 1/4 cup coconut flour. The almond flour I have is more like meal, so the coconut flour is a nice texture difference. Also used fresh lemon juice and zest in place of some of the sour cream..keeping 3/4 cup wet ingredients total. Lastly, I used 1 tablespoon of chia seeds with the poppy seeds for extra fibre. Very happy with the results. Hi Renee, Yes, that should work. So nice of you to do that! 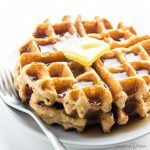 I loved this recipe, however I wanted to share with my friend, who is also on keto but he can’t have nuts… Is there anyway to sub the almond flour? Hi Ashley, Possibly sunflower seed flour could work but you’d taste the flavor in there. I really like the taste and texture of this cake – I’ve been using the powdered monk fruit/erythritol as the sweetener – can I use granulated monk fruit/erythritol in place of the powdered? Thank you, Dana! The icing needs a powdered sweetener so it’s not grainy. You can use granulated (which I do) in the cake itself. This cake is great! For those that found the cake too dense. I have found if I beat the eggs in a flourless cake before adding them it comes out fluffier. I made this today because yesterday I made my family a “real” lemon poppy seed cake-and I’m trying to talk my husband into keto eating. I thought if I could serve them side by side, he could see if there is much of a difference! He thought the keto version was more delicious-so after the first of the year he’s going to join me!! I omitted the vanilla extract and used the zest of one small lemon-along with the juice and added a bit of butter to the glaze! Can I use swerve in this recipe? Hi Denise, Yes, you can. 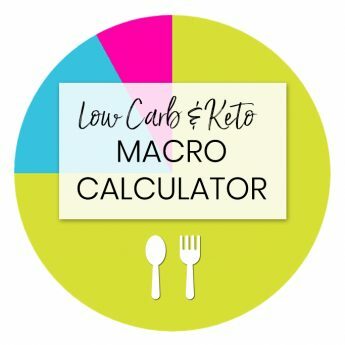 Check the low carb sweetener conversion calculator here. I was wondering if there is something I can use in place of sour cream? I was also wondering if I can replace the erithrytol with any granulated sugar, is the measure the same? Hi Sarah, Whole milk Greek yogurt would probably work instead of sour cream, but carbs would be a little higher. 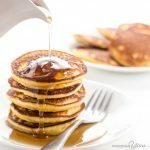 Yes, you can use granulated sugar – it would still be gluten-free but no longer low carb or keto. The amount would also be a bit less sugar compared to erythritol – check the sweetener conversion calculator here. Made the cake yesterday for a family dinner and it was very well received. That being said I used a 12 cup bundt pan too but the batter didn’t really rise so it was a smaller cake. I can’t help but wonder why it didn’t rise. Is it because there wasn’t any xanthum or guar gum added? Did it require more baking powder? Regardless, it was delicious and is definitely worth repeating the recipe with perhaps a few adjustments to improve the final result. Hi Lori-Ann, I’m glad your family liked the cake. Xanthan gum helps with texture but doesn’t typically affect rising. Was your baking powder fresh? That could be part of it. The other part might be that the batter needed to be mixer more to create more air. Almond flour never rises as much as traditional wheat flour, but it should rise some. I just made this cake in two 9″ cake pans. I let it bake for 1/2 hour and toothpick came out clean so l took it out of the oven. Unfortunately I could not remove it from the cake pans without it breaking. I did butter the pans first so l’m not sure what went wrong. Any suggestions? Hi Sandra, I’m glad you liked the taste! Did you let the cakes cool completely before removing them from the pans? Also, if you’re not using springform pans it’s best to line the bottom with parchment paper. Of course that doesn’t apply for a bundt pan, but I find it comes out of that more easily once cooled. Amazing! I have an insatiable sweet tooth and diet is a swear word! Making a food lifestyle change Is always easy for me in the short term. This food lifestyle change can’t be short term, I’m in it for the long run. Finding recipes like this one makes me believe that I can accomplish this! The batter was delicious even before it was cooked! Thank you so much for helping me make important changes in my life that I can stick to you. I am so happy to hear that, Jennifer! Thank you! Hi there, I have been following the Keto diet for several months now and I was really craving dessert. I made this cake and it was delicious. So moist and hit the spot. I left off the glaze to save on calories but now I do not know how to calculate the Calories, Fat, Carb and Protein. Any chance you could send me this? It would be much appreciated. Hi Ilana, I’m so glad you liked the bundt cake! You can enter the ingredients into an online calculator. Depending on which one you use, you may want to omit entering the sweetener because many calculators include this incorrectly. I just baked this bundt cake, it came out delicious! Thank you for your recipes; I have been baking and making desserts since started my low carb diet because I need to have all my sweets ready. For this recipe I did use just one tsp of lemon extract instead of two, I think the one I got has so much alcohol in it; the flavor came out perfect. I tried it warm, couldn’t wait, your cakes recipes are always the best. I am so happy you liked the cake, Cecelia! Please come back soon! I had to use different kinds of sweeteners as I was short on erythritol for the lemon poppy seed cake, including some stevia blend and some powdered swerve to make one cup of sweetener. Has this ever happened to you and will it mess up the moisture or ratios for success? Thank you for your website but I must comment on difficulty with some interference with trying to get this down with some sponsor I guess. Hi Carol, While I haven’t tried for this specific recipe, combining sweeteners should be fine. The only issue might be that, if you used a stevia blend, it might be too sweet, as these are usually sweeter cup-for-cup compared to erythritol. If this was the result you had, you could try reducing the sweetener in the glaze to offset the super sweet cake. The ads help support this site and keep the recipes free for you – thank you for understanding. Yay! I am so happy to hear that, Maria! I’m wanting to make this, but I’m wondering how much “exactly” of my Lorannes lemon bakery emulsion I should use. Do you know how the stuff that you used compares strength wise? Hi John, I’m sorry, I haven’t tried that one. Emulsions don’t have alcohol so there’s less risk with overdoing them, though. I’d try the same amount as I used of the extract, or if you want to be on the safe side try a bit less. I LOVE this recipe. First made it for Mother’s Day, and then for an end-of-year celebration for my high school students (one boy ate 3 pieces!). This last week we had family from out of town visiting, and my daughter requested bundt cake, but she doesn’t like lemon. So, I left out the lemon extract, added 3t cinnamon and 2 peeled, diced apples (my family isn’t low carb), and then drizzled some of your caramel sauce over the top. SO GOOD! None of them knew it was gluten free and mostly low-carb. Thanks for such a great recipe! I love to hear that, Erin! Please come back again soon! I made this cake a couple of weeks ago and making it again right now!! It is delicious!!! Turned out perfectly. Yay! I am so happy to hear that, Shelly! Have a nice day! Hi Mary, Low carb baked goods don’t rise as much as wheat ones, but usually it does rise some. The batter might have needed to be mixed more? Also, if it was dry, it may have needed to bake for less time. I’m glad it still tasted good! 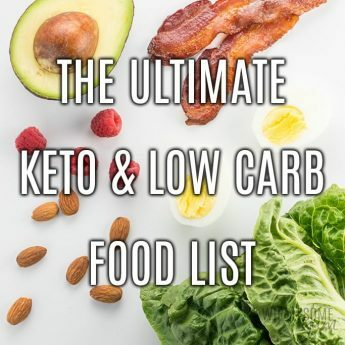 I started the keto diet in June and while my sugar cravings have dwindled considerably, they still happen. This cake was amazing and took care of the need for a dessert! This recipe will be at the top of my go-to list. Thank you so much for sharing it! I am so happy you enjoyed the cake, Sharolyn! Hello, I don’t have any erythritol. Can I substitute with Truvia? If so, what would the amount be? Hi Dee, Yes, you can – you’d need less. Here is the sweetener conversion chart. Thank you, Anabella! I’m glad it worked for you using those modifications. Unfortunately it wouldn’t work with coconut flour. Sunflower seed meal would likely work, but I’m not sure that’s going to be any cheaper. The recipe was great! Thank you! I’m curious though about your macro calculations. With 3 cups of almond flour and 3/4 cup of Erythritol plus the powdered Erythritol I calculated higher carb numbers. 10 carbs! The calorie total was almost 2000 calories more than your calculations for the entire batch of 16 servings. Hi Amy, I’m glad you liked the cake! The nutrition info on the recipe card is per serving, not for the entire batch. This cake is fantastic! I made some changes to fit my dietary restrictions. Instead of sour cream, I used a small can of coconut cream including the liquid. I used 2 TBS lemon juice, and 2 TBS of chia seeds instead of poppy seeds. I also used 1 cup of Xylitol. Instead of the lemon glaze, topped with fresh strawberries and blueberries. I am so happy you liked it, Cindy! Thanks for sharing your tips with us! This is a favorite! I made it twice already. The best part is that it is freezable and does not change flavor or texture! After it cools, I cut the cake in slices, place a piece of parchment paper between each slice, pack it well in a container. Then, when we crave a dessert, I need only take out two slices, warm it in the microwave and, voila, we have “just out of the oven” cake. Delicious with a cup of tea. Thanks so much for this recipe. That sounds perfect with a cup of tea, Florence! OMG, what a great idea. I am the only one who eats Keto in my family and didn’t know how to make this without trying to eat it all quickly. Now I know how to store it, thanks. Made the cake, turned out fine but the glaze did not. It soaked into the cake & made that part taste not so good. Next time I will not do the glaze & maybe put it in 2 small loaf pans. Hi Dorothy, I’m glad you liked the cake! It does need to cool first before adding the glaze, otherwise it will soak in. You can definitely omit it if you want to! But instead of lemon essence, I used real lemon juice and a bit of zest! I am so happy you liked the cake, Shell! Thanks so much for stopping by! I wanted to love this cake so much! I took it to our family Easter dinner and I was so embarrassed when I took a bite of it. It tasted like it had been doused with rubbing alcohol! My son’s mother in law had tasted it already and didn’t say anything, fortunately, she has a good sense of humor and we laughed about me trying to poison everyone. Do you realize the recipe 2 TBSP of lemon extract? That is way too much; I found out the hard way. I hate to waste so much almond flour, let along four free range eggs. I was not happy to say the least. I came home and looked up other low carb recipes and found that they call for one half a TEASPOON of lemon extract along with lemon zest and lemon juice, only a small amount though, so I made that recipe tonight, along with the lemon glaze; it was so good! I see another one that has more lemon juice and zest and I am going to try that one as well since this other one doesn’t have a lemony enough flavor without the glaze. Hi Lisa, Sorry this happened to you! I appreciate the feedback. The lemon extract I use (link on the recipe card) is not that strong, and I’ve made this recipe 4 times with it with no alcohol taste. So unfortunately I think it was a difference in extracts, sorry about that! You should definitely use less if yours is very concentrated, and I added this note to the recipe so that people know. I hope you’ll try it again with less extract or consider trying the one I used. You know, I made and loved this cake and have been baking for many years. Your extract is most likely imitation and not pure. Another tweak I forgot to mention was baking at 375 instead of 350. That in itself would bake out some of the alcohol. I did it at a higher temp to obtain a crispier sugar crunch on the outside. It doesn’t dry it out either! Thank you, Lorel! I’m glad you liked it. Thanks for sharing the tip about the higher temperature. Hi I’m Ruth. I followed directions and my cake turned out really good. All except the glaze. It was soaked up by the cake. Any suggestions? Hi Ruth, Did you drizzle on the glaze while the cake was still hot? The heat would probably melt the glaze. Next time, cool the cake first. I’m glad you liked the cake otherwise! Hi Debbie! Thank you for the tip! Thanks for stopping by! I have a question about the erythritol measurement. Since it is only 60% as sweet as sugar, what would be the equivalent in sweetness? Suppose I want to use Pyure or Swerve? One cup of either one of those would be almost double the sweetness of pure erythritol. So, should the instructions be “sweetener equivalent to one cup of (traditional) sugar”? I don’t follow the keto diet, my problem is gluten so I use sugar in my recipes, specially demerara sugar. Would it be ok if I used sugar instead of erythritol? Hi Andréa, Yes, you definitely can! You’d need just a little bit less sugar compared to the erythritol amount. I have a conversion chart here. Yes! I would love this recipe with Coconut Flour as well as others. Thank you, Bettie! Will add that to my list. Would this pound cake taste OK without the poppy seeds? We love them but my husbands job has random drug testing and poppy seeds show up on drug tests. Does it spoil the taste without them? Hi Sandy! I think the pound cake would be find without poppy seeds. I hope you like it! Have a great day! What about Chia seeds? It should look the same but have added protien. Yes, Harold, chia seeds would be a perfect addition! And all these baked goods you make are perfect for the Passover keeping folks in the audience…the proliferation of so many non-wheat options is perfect for the holiday. Hi Marsha! Thank you for stopping by! What product is best to grease cake pans? If solid shortening or butter, should the pan be floured with almond flour? Do you use cooking sprays? Thanks for these recipes! Hi Cassandra, I usually use a spray bottle without any chemicals, but you can use any neutral tasting fat to grease the pan. I have not had to flour it, but you could. Can it be made with full fat yogurt instead of sour cream?? I haven’t tried that, but it could work. Let me know how it goes if you try! I tried to download this into my recipe box but it won’t let me confirm it but somehow there are 4 there and I can’t delete then is there a restriction on it? Hi Sherry, I’m not sure which recipe app you are using but if you are having issues the question would be for the creator of that app. In general, I recommend bookmarking the site and coming back here, rather than saving off elsewhere, because I regularly add updates and tips to make recipes better. Thank you, Patricia. I haven’t tested that, but it sounds like it might work. Let us know how it goes if you try! Great recipe! I’ve made a similar one just a couple of days ago, with coconut flour instead of almond flour and coconut cream instead of sour cream, ghee for butter, and using a large silicone mold instead “bundt pan”: it tasted really good even with these substitutions and I’m going to try also your version with this amazing idea for lemon glaze next time (but always adapting for dairy free restriction). Thank you, Roberta! Please let me know how it goes if you try it with those changes. For this recipe I wouldn’t recommend swapping the almond flour with coconut – it will be too dry. But the other changes sound like they might work. Love lemon anything! This looks wonderful! I do wonder, though, why you use lemon extract instead of lemon zest and lemon juice in the cake? Thank you, Elaine! I use lemon extract because it’s more potent. Definitely don’t use only lemon juice because it’s liquid and not that potent. You’d need to modify the other ingredient ratios to get the same batter consistency, and wouldn’t get much lemon flavor with only the juice. You could use lemon zest if you wanted to instead of extract, but you’d need more than the same amount of lemon extract. And, getting that much lemon zest would just take a while, so I used extract mainly for convenience. 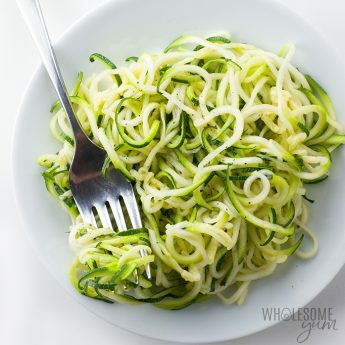 If you want to use lemon zest instead of extract, you can try 3-4 tbsp of zest plus 1-2 tbsp lemon juice instead. It sounds like a lot, but a bundt cake is pretty large. The conversion is usually double the amount of zest compared to a given amount of extract.